On Ordnance Survey maps it appears as a patch of white mist, like a ghost among the green forests and winding Norfolk lanes. Roads that enter the zone become tracks and multiply, as if this is still the 19th century, and the land is still measured by walking across it rather driving through it. Leaving the area, the tracks disappear or merge into busy modern roads. For a moment, they had been lost in time. But the lanes must travel through the time warp alone, for this strange area of Breckland (God knows, a curious enough landscape in itself) has been used by the British Army for the last sixty years as a battle training area. As this involves the firing of live ammunition, nobody lives in the zone, and the six former villages there have been able to softly and silently vanish. The soft Norfolk clunch out of which many of the buildings were made has melted into the ground, leaving mounds of flint, chimney stacks and the occasional cellar. Some buildings have been demolished, others adapted for training purposes. Plaques mark the locations of formerly significant buildings: the pubs, the schools, the post offices, the village halls. Very little remains, with the singular exception of the churches. All six villages had churches. Those at Buckenham Tofts and Sturton were abandoned in the years after the Reformation, and by the 18th century very little remained. The lost graveyard of St Andrew, Buckenham Tofts, was rediscovered when the pleasure gardens for the Hall were laid out in the early years of the 20th century. The site of St Mary, Sturton, was marked until recent years by an area of flint beside the Hall. 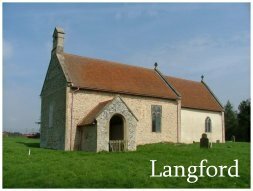 The other four villages, Langford, Stanford, Tottington and West Tofts, all had working churches when the zone was evacuated in 1944. 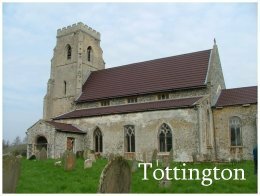 St Andrew Tottington is a typical East Anglian church, rebuilt from the wealth of this area in the 14th and 15th centuries with the addition of aisles and a clerestory. All Saints Stanford is typically East Anglian in a different way, with a round tower and a high nave hunched against it. 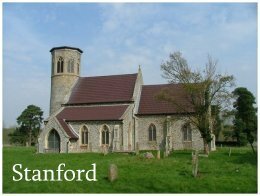 Both were heavily restored by the Victorians, Stanford excessively so, in a naive but enthusiastic manner by the Rector of the time. St Andrew at Langford is lovely, a soft little towerless Norman church with an extraordinary baroque monument in the chancel. St Mary West Tofts is the real surprise; a small medieval chuch transformed by Augustus Welby Pugin into a vast Gothic palace of worship. If it was outside the training area it would be much better known. The Ministry of Defence are good custodians of the buildings. They ensure the soundness and integrity of the exteriors, while the insides remain the responsibility of the Anglican Diocese of Norwich. This is a result of the settlement made in the 1940s, and it must be said that the Ministry has fulfilled its obligations with more enthusiasm than the Diocese. They protect the graveyards from incursion with high fences, and have recently replaced the roofs at Stanford and Tottington with blastproof panels in the style of pantiles. 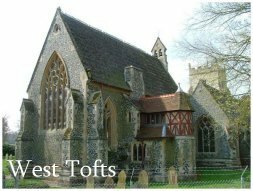 Only one of the churches has been returned to use in recent years, St Mary at West Tofts, but this has been mainly due to the interest and energy of individuals, some from the training area staff, rather than than any official policy of the Diocese. St Andrew at Langford could conceivably be used again if needed, but Stanford and Tottington churches are too far within the live firing zone for the public ever to be allowed access again. Sixty years leaves a lot of unexploded ammunition. As keen as they are on protecting the buildings, the Ministry are not happy with websites like this one, for several reasons. Firstly, the training area staff are simply not equipped to cope with the sheer volume of interest generated in the lost villages and their churches by books, articles and published photographs. Access to the churches is only possible for a severely limited time slot each year and under special circumstances; you must assume that if you apply to visit the churches as a result of seeing them on this website then you will not be given permission to do so. Secondly, according to the original settlement, priority must be given to those with a connection to the villages, particularly those wanting to visit graves of family members. If someone makes a request to visit a grave, or to be buried in the zone themselves, which is still possible, then the authenticity of their claim must be investigated. This takes time, and websites like this one increase the volume of false claims. Thirdly, there is still a sensitivity about the way in which the area was evacuated in 1944. The villagers gave up their homes at a time of great national significance, because the zone was needed for training for the Battle of Normandy, which eventually led to the end of the war in Europe. They did so willingly, and there was cheering at the public meeting at which the evacuation was announced. Some articles have argued that the sacrifice of the villagers was betrayed. I'm not convinced that this is the case. There was an assumption that the residents would be allowed back at the end of the war, but in truth the villages they had left behind were hardly worth returning to. Few of the villagers were landowners. Many of the buildings were tied cottages belonging to the Walsingham estate; few had running water, and there was no electricity. The land was poor farming land, and the residents had struggled to make a living. Most families were rehoused locally in better accommodation, and there were decent jobs on the land and in the factories and shops of Thetford, Swaffham and Watton. And it is easy to forget now that the war disrupted the lives of everyone in Britain, not just those in the zone. At a time when the State controlled people's lives in a way we would find wholly alien and unacceptable today, much of Britain was changed forever. Here in East Anglia it was the end of an old, unmechanised order, and Norfolk and Suffolk would never be the same again. While you would expect people to feel an emotional attachment to the place they were born, in truth few of the villagers would have wanted to return to the old life. There are regular reunions of former residents within the training area, but these are happy occasions, not sad ones. Generally, the former villagers do not wish they had been allowed to return; they were so much better off elsewhere. And now, it is an absurdity to think that the villages will ever be restored to their previous use, because they no longer exist, and there is no longer any reason for them to exist. Norfolk has many lost villages, not just here in the training area; what makes the zone special is that the pre-war pattern of country lanes, hedgerows and copses survives here, an extraordinarily valuable treasure. The Ministry maintains not just the churches, but the entire zone as a conservation area. The idea of this area being repopulated with executive commuter villages for Thetford and Swaffham is a horrifying one. Instead, the wind ripples the Breckland grasses; the deer, the sheep and the rabbits lead their uncomplicated lives. The incursions of armour are slight and temporary in this great vastness. The pattern of the past survives in a way that is lost elsewhere, in an England which has been redeveloped and rebuilt by generation after generation. Here, emptied of people now, untouched by the complications of civilisation, the past lingers on; and there is also the memory of the past, the ghosts and dreams of the old times, the lives once led now but names on the stones in the graveyards. Let this stand. 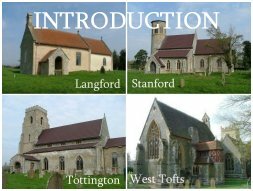 For in those days, Tottington and West Tofts were sizeable villages; but Stanford was tiny, and Langford barely existed. The churches were always out in the fields, and they remain there; the high-hedged lanes still weave nearby, and the silence of that earlier age still engulfs them. Let them remain so.